Eat, eat, eat! If that's all you do, that's all you deserve: one mouthful after another. But if you pay attention, you start to taste shadings of difference: good, better, best. Herewith, Cornichon's personal roster of the tastiest Belltown served up in 2007. Kevin Davis at Steelhead Diner, Chicken Tikka at Marjorie, Lamb with hummus at Black Bottle. Belltown Restaurant of the Year: Steelhead Diner, not even a year old and clearly atop the dining scene. Hands down the best oysters of the season, "caviar pie" that's already a legend, jumbo crabcakes that taste like the ocean, a commitment to local and organic ingredients, a serious wine list that sticks to approachable Pacific Northwest bottles. From his post in the corner of the kitchen, Kevin Davis oversees a dining room that's half local, half tourist, all happy. Bravo! Belltown Newcomer of the Year: A big welcome to Txori, the tiny Basque pintxos bar which gets me in, gives me a drink and a bite, and sends me on my way for under ten bucks and under half an hour. You can get a short glass of Stella for two bucks! It's called a zurito. And a gilda--anchovy, olive and peppers on a crunchy slice of Le Panier bread--for $3.50. Haven't had this much fun standing at a counter since, well, tapas-hopping in Spain. Runners-up: Tavolata, Entre Nous and Local Vine. Most imaginative Belltown promotion: Campagne's ratatouille cooking classes for kids. Best Belltown Bar: the charming, cozy alcove at the entrance to Marjorie, where owner Donna Moodie often holds court while barman Ben Sherwood mixes exceptionally generous drinks and the kitchen turns out delectable plates like chicken tikka. At happy hour, try the pulled pork sandwiches with a Red Stripe. Best Belltown Bites: Black Bottle's lamb with hummus, Tavolata's gnocchi with a ragu beef tongue, 94 Stewart's braised lamb shank, Local Vine's wagyu beef, Txori's Gulas Pil-Pil, Le Pichet's beet salad with sweetbreads. So long, 2007! Here's to many happy meals in 2008! Published a pretty straightforward critique of the new Zagat guide a couple of days ago, crossposted on Seattlest.com. Cornichon readers approved, but somebody reading Seattlest felt offended. Read on for the complete comment string. (The good stuff comes toward the end.) Too touchy? Moi? In response, have started a new blog titled The Short List: Seattle. What Cornichon likes, period. Michael Ruhlman is something of a foodie phenom. 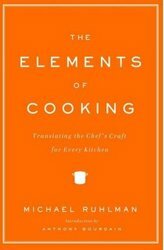 A journalist who fell into cooking after writing about education and boatbuilding, he has collaborated on a series of celebrity-chef cookbooks (with Eric Ripert and Thomas Keller), contributes regularly to the New York Times and is often on TV as a panelist or judge for reality-cooking shows. He also has an extensive website, ruhlman.com, that was just named the best industry-related food blog (and best chef blog) on the internetz. 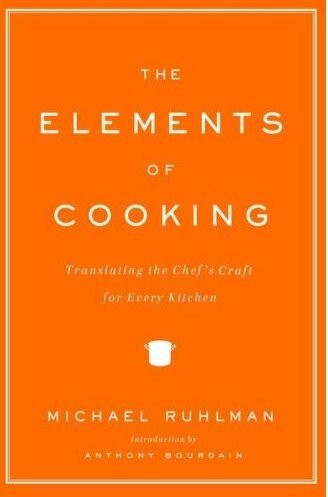 Ruhlman's latest publication is a book called The Elements of Cooking, an obvious echo of Strunk & White's The Elements of Style. 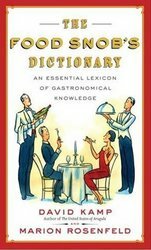 After a few uninspired essays (Stock, Salt, Eggs), the book is a quasi-encyclopedia of cooking terms, from Acid to Zester. Each entry is what you'd expect if you asked a humorless, pedantic friend to explain something: "what does al dente mean?" "what's kimchi? and so on. Three categories of soup (clear, cream, puree). Cook, sous-chef and line cook get separate entries. But Half-and-Half? Spatula? David Kamp, meanwhile, is out with the Food Snob's Dictionary, a hilarious "essential lexicon of gastronomical knowledge." You may remember Vanity Fair writer Kamp as the author of The United States of Arugula, a deliciously gossipy history of the foodie movement that also happened to name almost everyone who had ever slept with James Beard, Craig Claiborne and Alice Waters. Wide circles, though not overlapping. Many of the two books' entries do overlap, however. But when Ruhlman is finished telling you what a brunoise is (a sauté of diced vegetables), Kamp adds "Maniacal chefs are fond of dismissing unworthy brunoises as 'Sheet!' or 'Merde!' and then demanding that the cowed apprentice chopper start over." Like the class clown, Kamp doesn't get the teacher's respect; that goes to the super-serious Ruhlman. But they're like the Spratts: between the two of them, they lick the platter clean. In the miopic eyes of the Euro-Centric VOGs (Viticultural Old Guard), Washington wine remains a bit of a curiosity: exactly two pages in the new World Atlas of Wine while France gets 100. Co-author Jancis Robinson spends enough time in the Pacific Northwest to know better, but she's up against the London-based Mitchell Beazely publishing colossus. Have no fear: Paul Gregutt to the rescue with a terrific guide devoted exclusively to the products of Washington's vineyards. Gregutt, my colleague many years ago at Seattle Weekly who currently writes for the Seattle Times and has a lively website of his own, has given us the best gift imaginable: a guide to Washington wines that makes sense of the 500-plus wineries. Not that Washington Wines & Wineries: The Essential Guide covers every single winery in the state; Gregutt limits himself to the top 100. Most importantly, he also picks the best vineyards, since nothing a winemaker does in the cellar will improve on the raw materials. In all wine writing, the thing to watch out for is a philosophy that equates winemaking with watchmaking, that wine is something that must needs be "crafted." 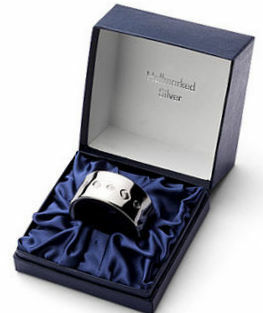 The "watchmaking" part is the discipline, the intellectual rigor, the sanitation. And, yes, the humility. And humility's what's missing at a lot of wineries. Not just those in Washington, mind you. Gregutt also gets the history right. He doesn't fall into the oak-lined trap laid by monster wines. He values longevity, solid science and craftsmanship. Yes, he hands out scores, but they're almost irrelevant. At about the same time Gregutt's book was released, Robert Parker's influential newsletter, The Wine Advocate, came out with a major piece on Washington wines, written not by Parker but by a recently promoted associate, Dr. Jay Miller. Miller knows little about Washington wine and is unfamiliar with the region's history, culture, winemaking traditions, or people. He sprayed high scores with abandon, sometimes making no sense at all (Walla Walla doesn't grow syrah, dude). The industry jumped on the article like thirsty camels, sucking up the praise for “Washington Wine.” and touting Parker scores. But they weren't Parker scores, they were Jay Miller scores. And they were, Gregutt points out, essentially meaningless. Gregutt's tome doesn't include pictures, though. There's already a fine picture book by photographer Sarah Matthews. Want both? Amazon's got a good package deal. 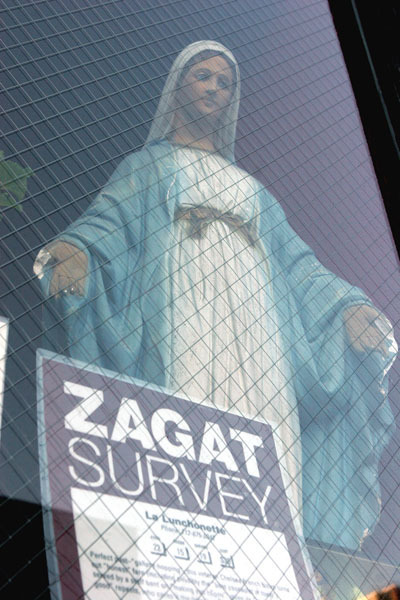 The new Zagat is out, at least the one "devoted to Seattle" restaurants. And with "all due respect" to "local editor" Alicia Comstock Arter (who also contributes to Northwest Palate), it's "a freakin mess." The trouble, "brewing for years," is that the "capsule reviews" take isolated "nouns and adjectives" from "reader comments" and string them together to make "nonsensical" and "often inaccurate" profiles. It's a Fox News approach to dining, all pseudo-oracular, disjointed headlines with "little substance." Another problem: the misleading ranking of what Zagat calls the "most popular" restaurants. Zagat's top five: Wild Ginger, Dahlia Lounge, Metropolitan Grill, Canlis and Zoe. Actual retail "most popular" (most customers, highest revenues) are Space Needle, Salty's, Ray's, Daniel's Broiler. 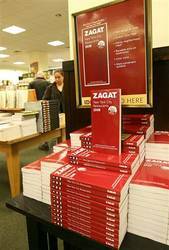 Either most Zagat diners don't eat where the rest of us do, or they lie about it. Not to mention that a book like this is outdated even before it hits the bookstores, never mind the editor's note suspiciously dated Dec. 5, 2007. Supposedly "new" places that aren't new at all (DiVino, Wild Rover, Lark, Umi). Oh, and don't think you can go to Tavolata for a "quiet conversation." More wildly inaccurate stuff online, where ZigZag Café is said to be "cigar friendly" (WTF? ); a reader complains that Salumi 's menu isn't vegetarian-friendly (this could happen only in Seattle! ); other readers ding Rover's and Canlis for being stuffy and overpriced (duh). It's the Yelp-ification of dining: acclamation and judgment by noisy, ignorant boors. If you like this sort of thing, the online version is free with registration. Bottom line for the print version: "a waste of $12.95." Silence of the Lamb Shank? Was asked the other day to name the most under-rated restaurant in Belltown. In the sense of under-appreciated. Gotta be 94 Stewart. While across-the-street neighbor Steelhead Diner gets the buzz, newcomer Txori draws the avant-garde, and Tavolata attracts the trendy, 94 Stewart simply serves excellent food. Last night's cumin-rubbed lamb shank in a pinot noir reduction was just about perfect. And chef Cindy Nelson wasn't afraid to surround the meat with Brussels sprouts, either. Granted, Lindsey Nelson's no longer on hand to manage the wine list (she's up at Coupage), but the kitchen remains in the good hands of her mom and her brother, Nic, who runs the remarkable cheese selection as well as a blog on the website, 94stewart.com. Hundreds of wines, literally, including great Barolos and Chiantis. Hundreds of favorable comment cards, literally, lining the back hallway. Highly recommended for the holidays, with a special $55 prix fixe menu. 1997: in January, Bill Clinton was sworn in for a second term; in August, Princess Diana was killed in a car crash; and a film about a shipwreck, Titanic, was the top-grossing movie. In the vineyards of the Old World, springtime came early, summer was hot, and the harvest was wet. The wine gurus and the voodoo sages swirled and tasted, ruminated and spat. Bah, they said, don't bother. Bah, said Parker. Bah, said Tanzer. Bah, said the Spectator. Don't bother. Funny thing, though. The wine doesn't care about the gurus; it doesn't read the Spectator, doesn't subscribe to Parker. Turns out, ten years on, the 1997s are pretty damn good. Arnie Millan, a wine conusltant with a fine cellar, pulled out a few bottles the other day for a 10-year retrospective tasting at Sorrentino Trattoria on Queen Anne. Two American cabs, a grand cru Burgundy, an Amarone, and half a dozen classified growths from Bordeaux. Wines this old, you don't just pop the cork; you decant carefully, then pour back into the original (cleaned & rinsed) bottle. Were there disappointments? Sure. La Fleur Pétrus seemed a bit weak, especially compared to Château de Sales, another Pomerol wine with lesser credentials but (in this case, at least) far more impressive staying power. And most of the wines were magnificent. Château Lynch-Bages was at its peak. And the Allegrini Amarone was both subtle and complex, full of young fruit with a port-like finish that made it a terrific match for Sorrentino's tiramisù. Icebergs be damned. All things come to those who wait, right? They buzz, they flit, they fly. They dart, they dash, they zip. Ethan Stowell putt-putts from Union (downtown) to Tavolata (Belltown) to Wolf (Queen Anne). Corino Bonjrada bounces from La Vita e Bella (Belltown) to Mondello (Magnolia). Jim Drohman shuttles between Le Pichet (Belltown/Market) to Café Presse (First Hill/Madison). Scott Staples hops from Zoë (Belltown) to Quinn's (Capitol Hill). Josef Jimenez doesn't ride himself but sends his cooks on a scooter--a Honda, not a Vespa--from Harvest Vine (Madison Valley) to Txori (Belltown). Hey, parking's tough in Belltown, but there's always room for a scooter. 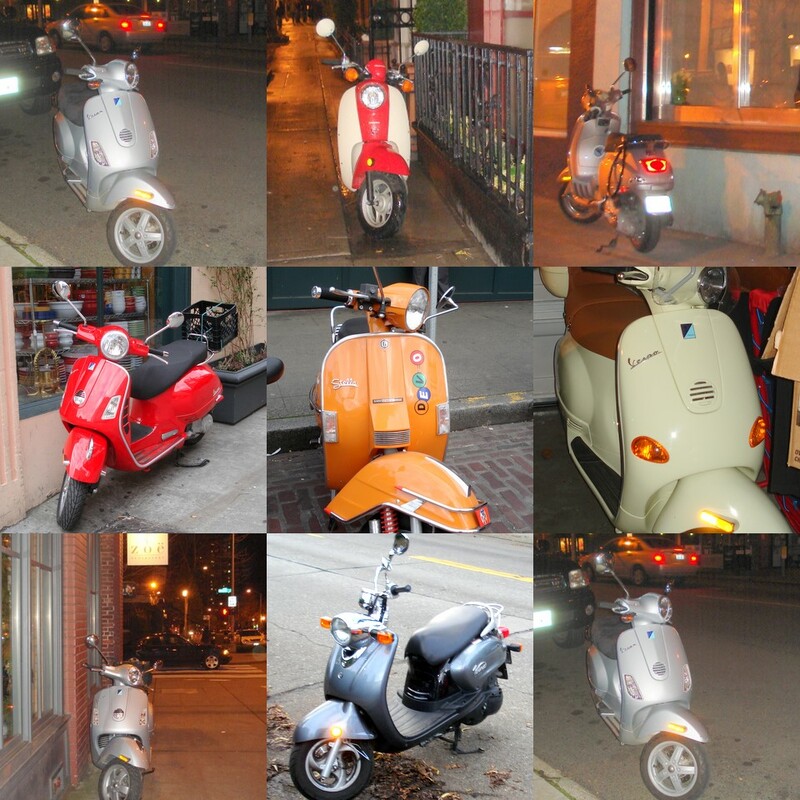 They are Seattle's wasps, those Vespas. Truly: vespa means wasp in Italian. That sure didn't last long, did it? Barely nine months. Rough world out there. Dog eat dog, bird eat fish, etc. Wow, Aunt Minnie from Moline can spend a summer afternoon watching a real Seattle chef! Gray Line of Seattle figures plenty of visitors will want to tag along on a trip through the market and demo in the kitchen. Jason Wilson of Crush is the only "name" to sign up, but the Space Needle, El Gaucho and Palisade are also on the list for the 3-1/2 hour programs. Don't take this wrong. Local celebrity chefs like Kerry Sear have been doing market tours for years (a bargain at $75, including lunch with wine). Gray Line's just making it possible for outsiders to pretend they're insiders, if only for an afternoon, buy springing for Product 1326. Says Gray Line's Judy Sprute, "People are looking for personal, interactive experiences during their vacations." She expects the 20 tour dates to sell out quickly because "it's a unique way to experience Seattle." The $100 tab doesn't include an actual lunch, however. Gray Line says it hopes customers "take the opportunity to return to your tour location for a full meal during your stay." From the Zebraguy at Highfield Ranch in California. garlic, carrots, salt, pepper, and enough water to keep the mess at a low boil for nearly 20 hrs. When I came home last night the house smelled pungently delicious, and I had me a fine bowl of goat meat pulled off the bone, along with some of the broth and most of the carrots. I put the pot out overnight to let the fat congeal. This morning I pulled the fat off the top and set it aside as an option to add to the tougher meat if we want to make hamburger. That's the middle lower container in the attached photo. Then I pulled the meat off the bones, separating the fatty and gristly parts into another bowl for the dogs and cats (lower right bowl in photo). Three of the biggest bones are hardy enough for the pooches; the rest went into the trash. What's still in the pot (left) is the basis of a fine soup. Magazine called Cooking Light, which runs "supper clubs" around the country in addition to printing a monthly collection of recipes, picks Seattle as the nation's number one city for healthy eating, just ahead of Portland. Strange, cuz their suppers are sponsored by Benefiber, Tums and Viva paper towels. Their most recent local event was held at that temple of elegance and haute cuisine, The Edgewater. Aw, c'mon, Cornichon! Don't be such a frigging cynic! Magazine's editorial heart is in the right place (see below the jump), even if the marketing department sometimes seems to be on a different wavelength. Happy to learn that our legions of restaurant cooks are making a living wage. ¿De veras, muchachos? ¿Realmente? Continue reading We're Number One? Really?.